There’s a bit of a learning curve when it comes to understanding all of the aspects surrounding cannabis, but we’ve got you covered. What happens to your body when you get high? Should you smoke or vape? And what happens if you get too high? This guide aims to answer some of those burning questions. Is Canada ready for cannabis legalization? Cannabis is a substance made up of the dried and shredded parts of the Cannabis sativa plant, which can include the flowers, seeds, stems and leaves. While it has traditionally been used to produce hemp products for making textiles, rope, and cosmetics, cannabis is more popularly known as shorthand for the psychotropic plant which can be smoked in cigarette-like joints, pipes or vapourizers, cooked into edibles or liquefied into oils. How could cannabis affect your body? There isn’t a single set of ways that cannabis affects everyone but there can be changes to your memory, sleep patterns, sense of time, mood and most famously, appetite. Common effects include heightened senses which can make colours seem brighter, a relaxed sense of well-being, hallucinations and feeling anxious, panicked or even feeling afraid. Health Canada says that these effects can be felt within minutes or half an hour, but that can also vary based on how the cannabis is consumed. There is research suggesting that different strains can affect people based on its chemotypes — or variations in the chemical compositions. But even how it’s consumed can trigger different effects. How can you use cannabis? The most common way of consuming cannabis is by smoking the dried flowers. These can be put into sticky and dense clumps known as buds. These buds can be wrapped in special papers, which are pre-rolled or rolled by the user. These are often called joints or spliffs. A variation of this are blunts, which is when the buds are rolled in tobacco leaves and smoked. Another way to smoke cannabis is in a bong, which is a pipe attached to a water-filled bowl with an opening for the plant to burned by a lighter. Taking a puff, toke or hit means to breathe in the resulting smoke and then controlling its effect by choosing to exhale or inhale. In all these cases, inhaling it can fast-track the chemicals into your lungs and make the feeling of getting high more immediate. Cannabis oils can be consumed orally and the effect can take more time to be felt because the chemicals have to work through the digestive system. This may lead to more intense feelings, especially if you don’t wait for the initial effects to hit before consuming more. The benefits to taking oils are how easy it is to consume. Vaping is having cannabis flowers or oils heat dried through an electronic device known as a vapourizer. The resulting effect creates a vapour filled with cannabinoids, the chemical ingredient in cannabis. Another way to get high is eating cannabis-infused foods in edibles like brownies, cakes or cookies — none of which has been legalized for sale yet. Edibles which can eaten recreationally will become available for purchase within a year of legalization on Oct. 17. But this hasn’t stopped some entrepreneurs from preparing their own weed-laced goodies in preparation of that date. These edibles can be made with cannabis oils or dried flowers and can be a good option if you’re looking to avoid the smoke from joints or pipes. Health Canada notes that edibles have a long latency period after consumption — ranging from half an hour to four hours before the chemicals kick in. These effects can be more potent and affect you longer than simply smoking a joint. So Toronto-based cannabis educator Irie Selkirk says to pace yourself lest you make the “rookie move” of accidentally consuming too much because you don’t think you took enough. Freaking out? How you can stop the feeling of being high? If you feel nausea, anxiety or dizziness after consuming cannabis, it could mean you’ve gotten higher than you were expecting and are now “greening out.” So while there are limited scientific studies looking at how to intentionally mellow out, there are a few homemade remedies that could help. Selkirk recommends counteracting that high feeling with strong smells such as sniffing a tart lemon, peppercorn or cloves. What could also help is drinking a sugary beverage or simply finding a place to lie down. But if the effects feel severe or more intense, it may be necessary to seek medical help. How do cannabis chemicals work? When consuming cannabis, an “orchestra” of over a 100 cannabinoids are released which can act on receptors throughout the body, Oyedeji Ayonrinde, a psychiatry professor at Queen's University told The Canadian Press. The main two agents are delta 9-tetrahydrocannabinol (THC) which creates the common euphoric feeling of “being high” by triggering the release of the chemical dopamine; and cannabidiol (CBD) can produce weed’s more chill effects. THC is the psychoactive compound while CBD is responsible for many of the plants’ physical effects and has been used to treat anxiety, pain, inflammation, insomnia, nausea and even epilepsy. Ayonrinde adds that the effects of getting high are due to the ratio between THC and CBD in a product. 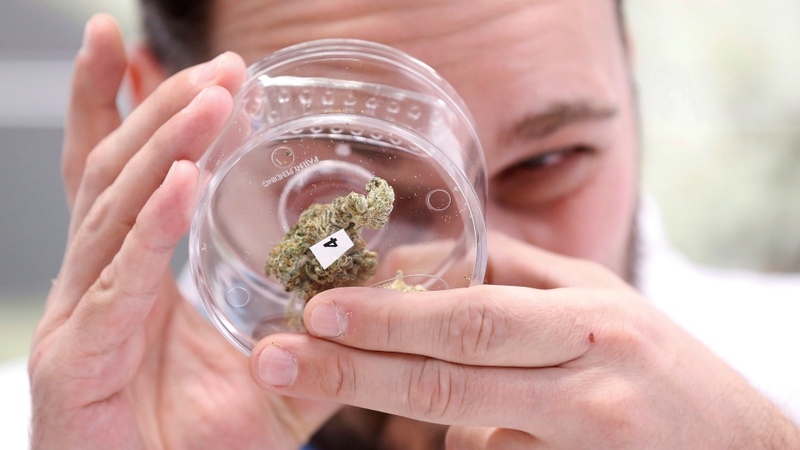 He recommended first time users start with products or strains that only have 20 per cent THC. He also says to be mindful of the CBD amounts too, because a higher CBD amount could can rein in THC’s effects. He said to think of the two compounds as a car’s accelerator and the brakes respectively.The stronger the CBD, the stronger the brakes. After legalization, most cannabis products will have these ratios on packages of bud and cannabis oil. The three common types are sativa, indica or a hybrid of the two. The supposed differences between them is that sativa strains are commonly associated with uplifting feelings, while indicas have the more mellowing effect. But it isn’t cut and dry. For example, some sativa strains can have the calming effects instead, while some indica strains can give you that energetic feeling. But what is clearer is that with the advent of hybrids, the potencies and strengths of pot can be much stronger. In fact, Ayonrinde says that the THC levels can be up to ten times higher than in decades past. So be sure to check the combinations and THC levels. Are there differences between medical and recreational? No. The main differences stem from dosages, potency and how they are used. If cannabis products are something you’re considering to treat issues like Glaucoma or to reduce the pain during cancer treatment, a medical professional can help find the strength and method right for the user.